The Force 3 is Corsairs interpretaion of a SandForce SF-2281 based SSD paired up with asynchronous NAND Flash memory. What we have here is a 120 Gigabyte version of the drive and we'll take a closer look what this thing can and what it can't. 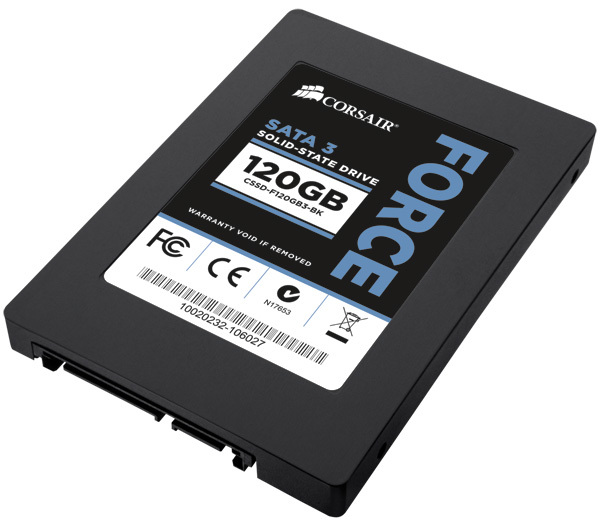 With the Force 3, Corsair has another SATA-III SSD in its portfolio that is based on the latest SandForce SF-2281 controller but compared to the Force GT the Force 3 uses asynchronous NAND Flash. This has the consequence that you wont get as much performance out of this drive as with a one that comes with synchronous flash memory. On the other hand the asynchronous NAND flash is cheaper and therefore the drive is less expensive than the Force GT. In the case of the Force 3 Corsair uses ONFi-1.0 NAND Flash which has been manufactured by Micron and comes with 25 nanometer structures. On the 120 Gigabyte drive there are 16 ICs whereas each offers eight Gigabyte storing capacity. The exact identification number is: 29F64G08CBAAA. The test sample that reached our office arrived in a very small box. As you'd already expect from a first look the there is only a 2.5-to-3.5-inch adapter bracket included in the delivery. You wont find any cloning software like for example Acronis Disk Image or Norton Ghost.